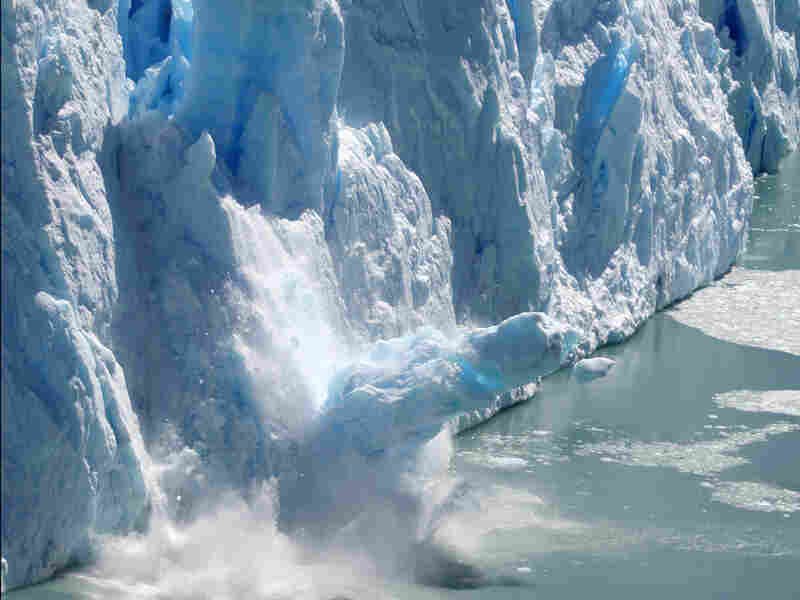 Predicting The Crash: Tracking Tipping Points Whether it's a glacier that caves in, a fish population that collapses or a market that crashes, new research is finding that many systems can reach a tipping point — where they change dramatically and unexpectedly. Some scientists believe they might be able to predict these sudden changes. A glacier in Patagonia, Argentina, calves, with a sudden collapse of ice. Researchers say that the activity that precedes these types of tipping points and the triggers that cause them may follow predictable patterns. What do sardine populations, Wall Street and Antarctica have in common? The answer is, they can all reach a critical moment — a tipping point — and change dramatically and unexpectedly. Fish populations can crash. Markets can, too. And Antarctic ice shelves can melt with little warning. Those sudden changes can have an enormous impact, so it would be great to know about them before they happened. Some scientists believe they might be able to predict tipping points. And they have issued a progress report in a recent issue of Nature. Despite the huge differences between financial markets, fish and ice, there are deep patterns they have in common. Ice can stay stable for long periods of time, but with the right trigger it can melt rapidly. And, we all know that financial markets can do the same, says George Sugihara at the Scripps Institution of Oceanography. "What really captures my imagination about this is the fact that you get similar kinds of behavior across many different kinds of systems," Sugihara says. Like colleagues around the world, Sugihara has been trying to describe mathematically how tipping points occur. And he's not just interested in what a system looks like as it goes over a catastrophic tipping point. He's interested in what happens right before that moment. "What's intriguing is a lot of these things have similar precursors, or similar early signals," he says. For example, in certain kinds of systems, there's an eerie quiet — the calm before the storm. Other systems behave differently. Financial markets start acting erratically right before they reach a tipping point, he says. "There are a number of [research] papers citing an increase in volatility just prior to a large systemic event." Sugihara says. But then he is compelled to add: "There's some evidence to the contrary, also." This is tough terrain. The challenge is to look at a system that still seems to be stable and tell whether it's running headlong toward a tipping point. Sugihara is optimistic about our ability to predict that. The stakes are huge. Think of possible tipping points in the global climate. A catastrophic change in Greenland ice-melting could rapidly raise sea level. A dramatic shift in rainfall patterns could plunge areas into perennial drought. Ocean circulation shifts could actually make Europe get chilly. "These things all would make the impacts of climate change much worse if they were to occur, so it would be wonderful if we could see them coming," says Jonathan Overpeck at the University of Arizona. For example, water resource managers can plan ahead if they can tell the difference between a temporary drought and a permanent new climate regime, he says. But advance knowledge can only help so much. What if rainfall shifted away from the Amazon rain forest, as some scientists project? The result would be that one of the most lush, diverse and productive ecosystems on Earth could turn to grassland. "That could occur very quickly, in the matter of just years to decades," Overpeck says. And it would probably be too late to do anything about it. That's just one of the drawbacks of predicting ecological tipping points. Another is that it's really hard to do. Scientists have been on this quest for many decades, says Rob Jackson at Duke University. "Our track record in predicting tipping points, however, is weak," Jackson says. "We missed the ozone hole, we missed the rapid melting of the North Pole in the last few years, and we missed last year's stock market crash. So I can't help but wonder, what will we miss this year?" Fortunately. you don't need to predict a specific catastrophe to make use of tipping point math. Sugihara from Scripps says that, for example, even if you can't predict that a particular fishery is on the verge of collapse, we know more broadly that laws that regulate fishing are pushing fish populations too close to their tipping points. And that's flirting with disaster, he says. "Fishing up to the tipping point is a very bad idea. You want to fish well below the tipping point." So he says we should revisit the laws that put these fisheries at risk. Sugihara says we also need better data for all systems that are in jeopardy. Unfortunately, in some cases information is getting worse. For example, we're losing climate-monitoring satellites faster than they're being replaced. And even the financial world has paid little attention to systemic tipping points, Sugihara says. "There's very little being thrown at this problem in any intelligent way. To me that's a total mystery." He's hoping this quiet field of research will reach its own tipping point, and finally get the attention it needs.